Eviaty, Eviaty (2005) Gejala Burnout Dan Persepsi Dukungan Rekan Sekerja Pada Perawat Unit Perawatan Intensif. Skripsi thesis, Universitas Tarumanagara. Burnout is a psychological syndrome of emotional exhaustion. depersonalization, and reduced personal accomplishment. The participants of this study are nurses who have been working at intensive care unit at least for one year. Data were obtained using questionnaire and processed using Spearman correlation. The correlation between burnout dimensions and perceived support from colleagues are r(32) = -0.484. p < 0.01 for emotional exhaustion; r(32) = -0.318, p < 0.05 for depersonalization; and r(32) = 0.256 , p > 0.05 for reduced personal accomplishment. 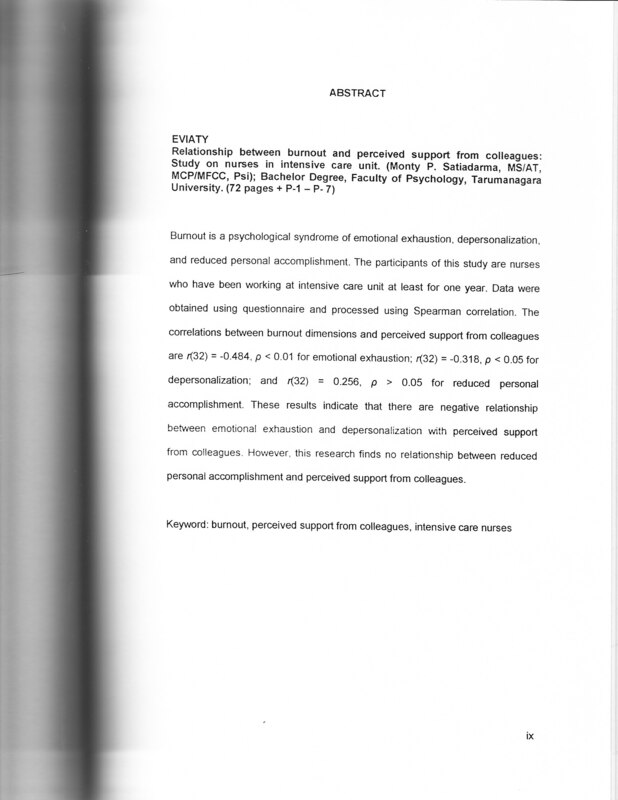 These results indicate that there are negative relationship between emotional exhaustion and depersonalization with perceived support from colleagues . However. this research finds no relationship between reduced personal accomplishment and perceived support from colleagues.